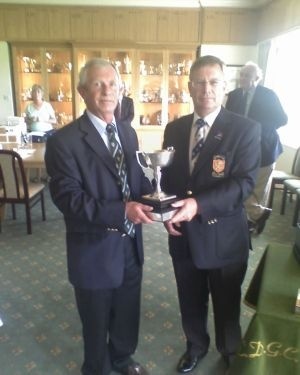 Congratulations to Campbell Boal Broadstone GC Campbell Boal being presented the Trophyfor winning the SWCGA Seniors Championship, on a wet and very windy two days at East Devon Golf Club. Campbell put together rounds of 75 and 77 for a total of 152 and tied with Devon golfer Brian Winteridge 80 72. There followed a sudden death play off starting at the first, both players drove off well but Campbell then put in a great shot hitting the green and leaving him self a birdie opportunity Brian missed the green and left his chip some 8 to 10 foot away. Campbell missed his putt which was conceded and with Brain missing his the title went to Dorset's Campbell Boal. A small mention must go to our County President David Lock who finished in Sixth place. The team to go through to the EGU Finals will again be Devon with a total of 776 having pipped Dorset by some 29 shots, Dorset held second place overnight and on day two whilst losing ground to a strong Devon team managed to hold off the challange from Gloucestershire beating them by some 14 shots to take second place. Credit must go to the team consisting of Barry Pavitt, Campbell Boal, David Lock, Rob Clapp, Brian Medlam, Bob Dilkes and Graham Taylor for grinding it out in some horrid conditions. This so I am told was down to the inspirational team talk by the Captain Anthony Eden who won the best over 70 prize. Budleigh Salterton is a lovely and quite difficult course on the cliff top. This leads to some very sloping fairways and greens which are difficult to read. Local knowledge is worth a great deal. If you add to that a head greenkeeper who has won their County Championship on more than one occasion and used every dificult pin position, greens that he had double cut each day, very strong winds both days and nearly continuous rain sometimes torrential the difficulty factor ranged from very difficult to extremely difficult. Down wind putts just kept going. With home advantage Devon won the National Team Championship Qualifier fairly comfortably with Dorset a good second. In the individual Championship Campbell Boal of Dorset won on the first hole of a play off with Brian Winteridge, the ex Hampshire County player. Brian had the round of the day with a 72 in some horrendous conditions to get into the play off. All in all quite a satifactory tournament for the Dorset team.